There are some works that come at me in ways I am not always prepared for. French composer Laurent Petitgirard's ballet The Little Prince (Naxos) qualifies. It combines choir and orchestra in ways that do not completely connect with me at certain points, largely in fact in the opening sections where it is the choir singing acapella. I feel the same way listening to those first passages as I did hearing Gorecki's Third Symphony. I recognize that many will find it accessible, yet it does not entirely move me. The ballet begins, then, which a series of elementary choral block chords, a series of "aaahs" as it were, which to me seems a little too much on the movie music edge of things, rather undistinguished to my ears. But that fairly quickly becomes more subtle, quieter, as instruments enter now and again. Finally a solo clarinet announces the end and a new beginning as the choir takes over once again, this time with a modern-almost-Gregorian line punctuated by bells and chimes. From here on in the music takes on character, more complex themes and development entering the fray. This isn't minimalism, but there is a stark facticity at times that has some of paired-down qualities of some of the more repetitious fare. By the middle of the third section there arrives a pulse on the mallets underneath choral "aahs" that have more sophistication to them, especially as punctuated by effective clarinet writing. It has some rhythmic bite with an insistent figure in seven, articulated by the chorus and taken to a more directly driving end by percussion and winds. The Budapest Studio Choir and the Honved Male Choir have plenty of pep and enthusiasm but sometimes seem not quite up the the long "aahing" that is required of them, especially in the fortissimo zone. The Hungarian Symphony Orchestra conducted by the composer fares better. They often appear in smaller combinations, rarely tutti, but the parts are interesting enough and the playing has character fitting to the score. Once we get to sections five through 14 we are on solid musical ground. There still are some "aahs" left but everything takes on a more inventive way, a more substantial melodic set of arcs, sometimes mysterious, all rather theatrical. So if I as a listener simply started with the fifth section, I would have less to dislike. In the end Petitgirard has an originality, there is a spark of inspiration. Perhaps other works to come will fully satisfy me. As to The Little Prince there is good music to be heard but some of the choral writing/performance seems less than angelic, yet not really demonic either. As with all Naxos releases, you cannot beat the price. Unless you are a rabid Francophile this one is not essential. 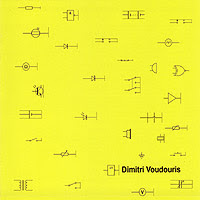 Greek-born Dimitri Voudouris (b 1961) writes electro-acoustic music in the grand manner. Like Xenakis and Stockhausen before him, he favors long audio-audible poems that utilize complex sounds in an almost symphonic manner, except this is high avant garde in result. And he does not remind of either composer in any concrete way. He does sound very much individual, original. His four-work release on Pogus (21056-2) brings some important music to our attention. Complex pitch-noise constructions come together and undergo extensive development and transformation in the long-formed pieces we hear. According to the liner notes, he "bases his technical and theoretical compositional approach on research of cognitive psycho-acoustic behavioural patterns in humans, and the behaviour of sounds in relation to continued environmental changes." Hearing in this case is believing. The music is more in the realm of flowing sustained soundscapes than it is a matter of serialist hot-potato passing. And for such flow the music is invitingly narrative-like. Each work seems a story in sound with no literal meaning but quite meaningful in an abstracted way. Voudouris to my mind is a major voice in the electronic music of the present. For all that this release gives you an excellent sampling of what he is about. All Gyro Gearloose folks like me will find it most pleasingly enveloping. Definitely recommended. It has been said of some artists that they could sing the phone book (for those of you who remember what that is) and still sound great. I have no doubt that the early music ensemble The Sixteen could do that. But there is so much else to perform that's worth hearing, why would they? Today's CD is a good example. 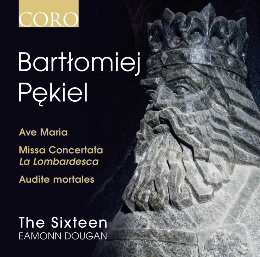 It is the music of Bartlomiej Pekiel (1633-70) (CORO 16110), a Polish baroque master who is virtually unknown over here in the States, and in the hands of The Sixteen comes through with all the charm and grace inherent in his music. The Sixteen under Eamonn Dougan give us authentic period performances with a flourish. Essentially the program consists of two mass settings, the brief "Missa a14," and the extended "Missa Concertata 'La Lombardesca,'" plus a number of shorter choral works. Some are acapella, some include accompanying instruments, all are movingly well wrought. I do recognize an adaptation of an old English carol (or vice versa); otherwise this is very much new music to me. It is beautifully performed, and I promise you that Pekiel is infinity more interesting than a performance of the phone book. In fact he is masterful. Composers of the Polish baroque? Here is one of the very best of the lot. And that is an excellent thing. 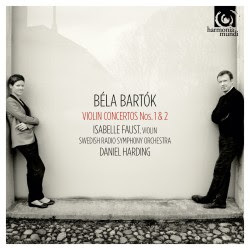 Bartok's Second Violin Concerto is a favorite with music lovers. His First is less well known. It was lost and only rediscovered after the composer's death. Plus it was written 30 years before his 1930s No. 2, so it goes back to the early days of his composing career. Isabelle Faust, a violinist with whom readers of this blog will be well acquainted, went back to the original manuscripts to make sure the performance edition she used was truly the authentic version. The result is Isabelle with the Swedish Radio Symphony under Daniel Harding in a new recording of the two concertos together (Harmonia Mundi). It is manna for Bartok enthusiasts; indeed beautiful music for anyone with ears. The first concerto reflects Bartok's love for a young violinist of his acquaintance at the time, and so understandably has some tenderness and a romantic quality. It is fascinating music regardless, not flying quite to the heights of the second, but sounding ravishing enough with Ms. Faust and the Swedish Radio Orchestra giving it a passionate reading. The second concerto has some of the most sublime and moving moments of any 20th century violin concerto, and that's saying quite a bit when you think of how many beautiful scores were created last century. Isabelle Faust is wholly simpatico with the music, reaching a contemporary high water mark in versions of the work, with a passionate attack that integrates the technical difficulties of her part with the broad sweep of the music. She sounds otherworldly. The Swedish Radio Symphony do a good job with Daniel Harding at the helm sounding fit and fully committed to the demands of the music. The second concerto in Ms. Faust's hands reminds us that great music takes humanity well beyond the rather mundane biological animals we all too often are. It is what transcends all, that recreates us for a time as beings that dwell in the clouds. Go there with this recording! 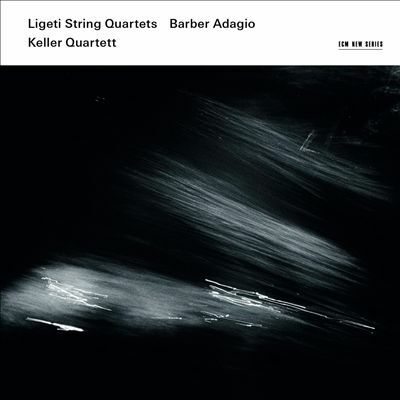 Ligeti's String Quartets are capstone works of the '50s-'60s. They epitomise both the advances and the creative power of new music at the height of the high modern period. They are deep, advanced, yet able to communicate directly to the listener regardless of background or ear-experience. The marvelous Keller Quartett from Budapest have newly recorded the two (ECM New Series B0018363-02) along with the original quartet version of Barber's "Adagio". The results are benchmark brilliance. To bookend the two explosively supercharged Ligeti works with the compact warmth and lyricism of the Barber was a great idea. The touching qualities of the "Adagio" set off the more space encompassing, cosmic quartets in ways that move the listener from end point to end point with multiple feelings of closure. The Ligeti works have never sounded better. In the Keller Quartett's hands the music gets maximum articulation, passion and precision, sonically spectacular realizations of alternating sotto voce mystery and expressive outbursts. The Barber too sounds just right. I've heard no better renditions of either three works. The Keller Quartett do the music full justice, no easy task, and the spacious soundstaging of the stereo audio does much to capture the finely focused nuances of the quartet in high definition sound. Very much recommended. You should have this one. The early is in the late, the late in the early. To hear Stile Antico's vocal performances of English Tudor Church music is to hear something very old yet somehow right for our ears today--not in terms of the actual musical sequences so much as the vibrato-less voices in their bell-like purity. 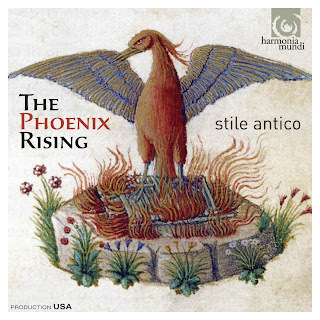 All this can be heard in an excellently subtle-ecstatic manner on Antico's new release The Phoenix Rising (Harmonia Mundi 807572). Early Music sounds current in its own way partially because there are some composers today, Arvo Part for one, that have been inspired by the sound of it all. That doesn't mean there is a close fit between something like Tudor Church Music and something in the Neo-Early vein. The Tudors represented here were masters of the long flowing contrapuntal line, the close harmonies, the various intervallic motions up or down according to what they thought was "right," these are things special to that period and style. And the anthology at hand gives it to us in a great wealth of expressive voicings. The centerpiece is William Byrd's "Mass in Five Parts," but it is equally present in the short works by him, Tallis, Morley, Gibbons, Taverner, et al. 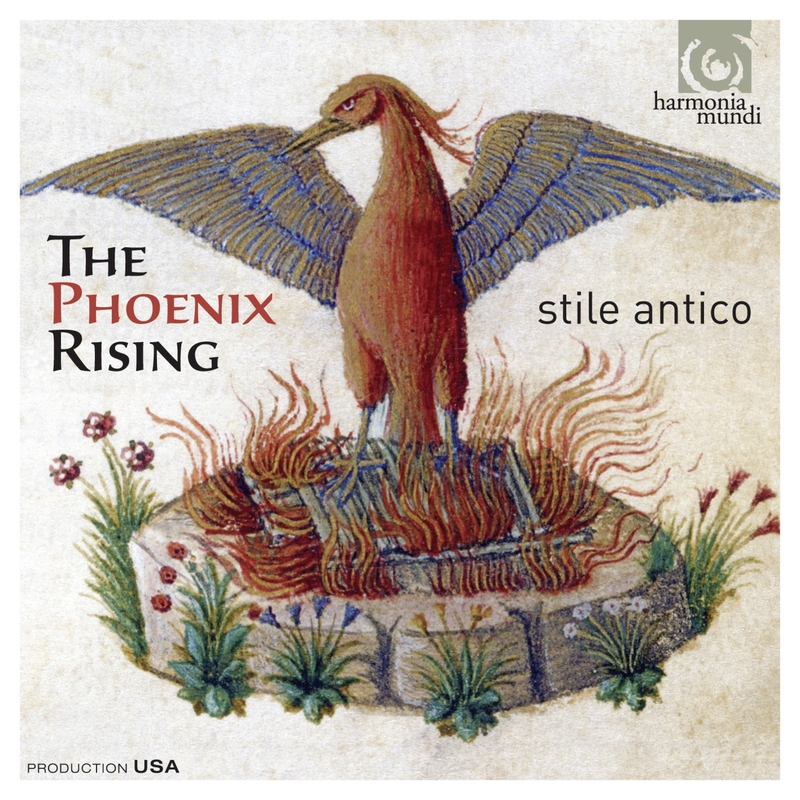 It's music that gives you the chills, for its ancient voices speaking clearly to us today, for the sheer beauty of its note choices and for the gracious transparency of Stile Antico's outstanding musicianship. If you could have only one choral recording representing this style and time, this probably should be it. But if you have a wealth of early music in your music library, this will be most welcome to you, too. Stunning. Stunning all around. The sound of music for two pianos is different than that of music for one piano and four hands. It means of course that actual unisons are not in the offing, that the full range of the pianoforte is always at hand, and so the sound has its own shadings. 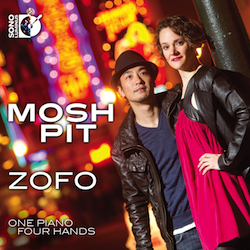 The sound factor comes out front in dramatic ways for ZOFO's recording Mosh Pit (Sono Luminus 92167). It's a six-work program of widely contrasting fare, brought to you in sterling sound by the four-handed behemoth Keisuke Nakagoshi and Eva-Maria Zimmermann. This Sono Luminus release comes as a regular CD and a surround-sound Blue Ray disk, so you can hear the duo in super detail or normal state-of-the-art stereo. In the end of course it's the music and performance that count first off. As with the notion of a mosh pit the artists bring together a widely contrasting program of early modern and newer works, all played with pretty exciting dash and sensitivity to motive balance. So we have Gershwin's "Cuban Overture," Nancarrow's "Sonatina," Barber's "Souvenirs," then on to the present with John Corigliano's "Gazebo Dances," Allen Shawn's "Three Dance Portraits," and Paul Schoenfield's "Five Days from the Life of a Manic Depressive." The music has drive and there are connecting links in the form of music that has roots in the dance, from Cuban-derived, ragtime, boogie-woogie and stride to some allusions to modern rock. It's a running thread present at times in the forefront only to recede, then come back again later. And in that way (Nancarrow being a direct link here) it does remind at times of the old player piano rolls which in fact often arranged the music in essence for what would take four hands to play. That is a pleasing reference that comes to bear at times but of course that is not to imply that ZOFO sound in any way mechanical. Far from it. This is a talented pair of players who lock into the music as one hydra-being of coordinated sound. ZOFO sound great, the program is refreshing and the sound stands out. Outstanding for all that. Very captivating and so very nice to hear. Recommended! Jorge Antunes has been fundamental to the Brazilian modernist avant garde since the beginning of the '60s. 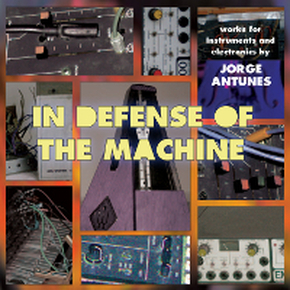 In Defense of the Machine (Pogus 21067-2) gives us an anthology of his electronic and acoustic music representing a long span of his career. There are seven works in all, most somewhat short, dating from 1965 to 2003. The first of the electronic works have that DIY sci-fi sort of ambiance typical of early electronic studio productions in the first phase. The music goes from there to cover a good bit of ground. It is music that has definite moments, is quite obviously of historic interest but more than that it is interesting music. Compare it to a small show of the paintings of Antoni Tapies, abstract painter. If you know his work it will confirm his importance and relevance; if you don't it will open up a world where you must meet the artist half-way as it were, and open yourself up to his style on its own grounds. Then you can decide what you think. This Jorge Antunes anthology is like that. I found it all quite fascinating, but do feel like I have more listening to do to get completely acclimated. That is a good sign. Samuel Barber and Howard Hanson, 20th Century North America's principal neo-romantics. Their music transcended the style so that it was more their music than romantic music per se, but nonetheless they belong together as very different peas from the same pod, so to say. The Ying String Quartet have pulled together some gems the two created over the course of their careers--for string quartet plus a few guests. 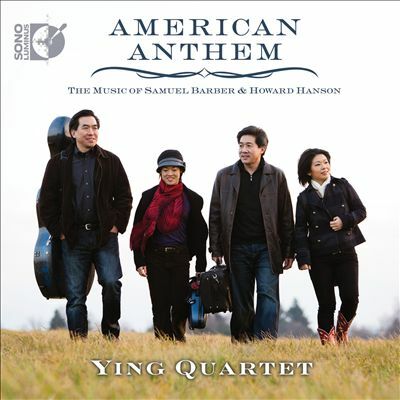 The result is the well-considered American Anthem (Sono Luminus 92166). It comes in a two-disk set, as is more-or-less standard with Sono Luminus releases, as a regular CD and a surround-sound Blueray disk. These are works that helped define the respective composers. For the first time we have the complete four-movement version of Barber's op. 11 Quartet (with the first recording of movement four) and it contains the original version of Barber's "Adagio," which is perhaps his most famous piece, haunting in its wistful melancholy. Hearing the full four movements for the first time has a revelatory quality. Then there is his very first opus, the "Serenade for String Quartet," certainly worth hearing. "Dover Beach" in its version for quartet and baritone (Randall Scarlatta) has a lingering expressive beauty. That concludes the Barber portion of the program, and if that's all there was I would be satisfied. But there of course is more. The two works by Howard Hanson, the "String Quartet," op 23 and "Concerto da Camera," op 7 (the latter with the addition of piano [Adam Neiman]) fleshes out our picture of the composer--he is generally more well known for his symphonies--and provides a good foil for the Barber works. As a bonus the contemporary Randall Thompson's "Alleluia" (as arranged by the Ying Quartet) concludes the program on an interesting note. The Ying Quartet play the music like they were born to it, with expressive depth of feeling yet a keen ear for the many dynamic nuances the music offers. They are first-rate and so is this recording. A fine showcase of music generally not often enough performed, presented with sheer artistry. Henry Purcell was a baroque master, unquestionably. Yet his music does not get as much exposure as, say, Vivaldi, who has some superlative works, but perhaps is less consistently inventive taken as a whole. Part of that is Purcell's tragically short life and subsequently smaller output. He died at aged 36. 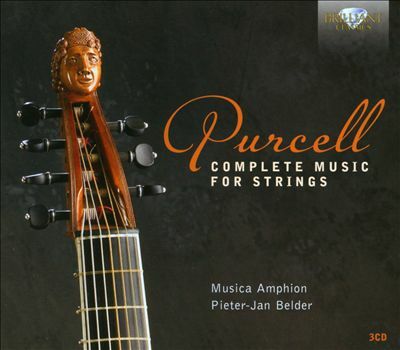 Be that as it may we have a treasure trove of Purcell on the new set Complete Music for Strings (Brilliant Classics 94619) as played by Musica Amphion, Pieter-Jan Belder, director. The three-CD set covers the "Twelve Sonatas of Three Parts" (1683), "Ten Sonatas in Four Parts" (1697) and the "Fantasias," each filling its own disk. This is a Brilliant Classics budget series release and the price is fantastic. But even if it weren't the music and performance would make it worthwhile. The works are played with a stately, sweet elegance in period style on what sound like instruments from the era. All is taken sans vibrato, as is not only appropriate but beautifully sonorous and musically transparent. And the music! These are excellent examples of Purcell as master of the long contrapuntal sequence. The thematic material is fully suited for such treatment and too there is never a banal moment in the three-hours give-or-take of music represented here. 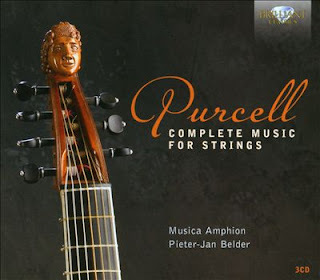 Purcell's masterful crafting of interactive part writing is a marvel to hear and the Musica Amphion instrumentalists give us definitive period performances. You can not go wrong at this price. Or any price. Very much recommended. And now...more! Speaking of the avant classical-jazz nexus I've got a pretty darn brilliant one today that combines heroically hip solo parts with orchestral power. 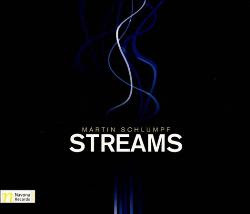 Martin Schlumpf is the man, Streams (Navona 5918) is the CD, and some kinetic magic is the end product. This is dynamism at your service, music that moves brightly and lithely from sector-to-sector, building ostinatos and/or creating linear momentum and chromatic harmonic thrust. There are three major works on the disk. Each features a different soloist (or two) in a concerto setting. "Mouvements for Piano and Orchestra" brings in Martin Levicky, "Waves for Solo Cello, Trumpet Obligato, String Orchestra and Computer" features Petr Nouzovsky on cello and Marek Vajo on trumpet, and "Streams for Clarinet, Bass Trombone and 17 Instruments" spotlights Matthias Muller on clarinet and David Taylor on bass trombone. The solo parts are rather wild and wooley and the orchestral interactions have logic and force. There is a slight minimalist element to be heard in the ostinatos but otherwise it is a matter of through-composed orchestral "killer-dillers" (as the old big band players used to call it) with real bite. The soloists and orchestra do more than perfunctory service to the scores. They shine. The Moravian Philharmonic handles the first two works and the newly formed PARMA Orchestra the last. I was especially intrigued with "Streams" for the out-jazz intricacy of the lines as played by Muller, Taylor (David is probably the premier modern jazz bass trombonist and he shows you part of why on this work) and the orchestra. I won't try to describe it. Suffice to say that the very first time I listened I remarked to myself, "holy cow!" or something similar. Eric Dolphy in orchestral heaven? Not exactly, but you get the idea I hope. The contemporary classical scene is one where many new recordings are not pressed in large quantities for the obvious reasons. There is a steady following of listeners but this is not music for the bulk sales some pop artists may expect. So any given modern classical release may not be readily available forever. Quantities are gone at some point and it could be some time before a repressing is forthcoming. That occurs to me as I write up my review notes for a chamber music anthology of eight works by seven composers, I believe all US-based--by residence if not by birth. 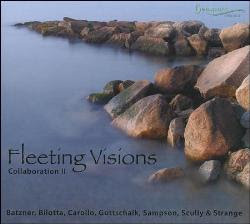 Fleeting Visions, Collaborations II (Beauport Classical 1804) came out in 2008 and certainly qualifies as one of the less heralded, small-quantity but large-statured releases of recent years. Some of the composers are not well known to me, others I've appreciated for some time. All turn in worthwhile work here. We've covered the music of some of them on these pages, especially Hawaii-based John Carollo. There are works by Carollo, Arthur Gottschalk, James Scully, Allen Strange, Jamie Leigh Sampson, Jay C. Batzner and two by John G. Bilotta. The works are in the high-art new modernist zone, written for small ensembles and soloists in sometimes unusual combinations, such as flute and clarinet (Gottschalk, Bilotta), solo clarinet (Scully), solo bassoon (Sampson), solo trumpet (Batzner) solo soprano saxophone (Strange), flute and oboe (Bilotta) and guitar and violin (Carollo). These are distinctively written, well-played works that go beyond the strictly serialist mentality into a less structurally rigorous but more expressive and personal mode. Some of the music is abstract and angular (Carollo, Bilotta) others more referential (Strange's Laurel and Hardy tribute), but all worth hearing. I am glad to have this one. The music is good, the instrumentation ever-shifting, and the overall thrust artful. It will definitely appeal to those who enjoy the more intimate and unusual chamber lineups playing shorter works of a thoroughgoing individuality. Grab a copy now while you can. 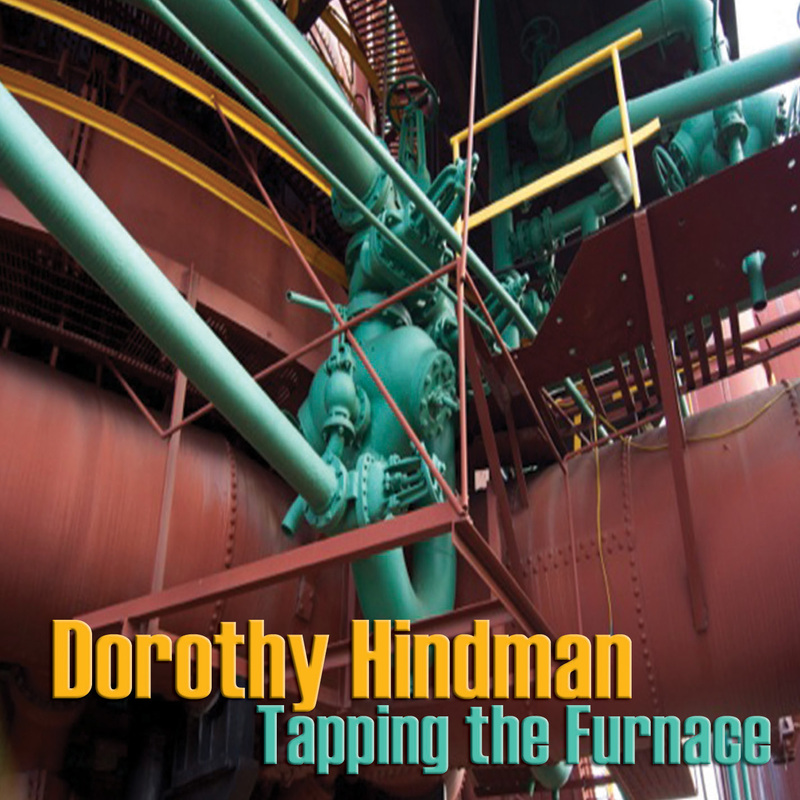 Dorothy Hindman writes music that forges a distinct modern classical-avant jazz nexus. In other words there is something of the latter sensibility in her musical vocabulary much of the time, and that something fits in seamlessly and expressively to the whole. Tapping the Furnace (Innova 848) presents her music in a variety of chamber settings, with a concluding work for symphony orchestra. There's much of interest on the disk. "Drift" has a vibrant, rhythmically lively ambiance. "drowningXnumbers" takes amplified cello as the medium and maps out distinctive abstractions with nicely colored textures. "Fin de cycle" sounds freely rubato with some virtuoso music for piano and digital media (i.e. electronic enhancement). The title work "Tapping the Furnace" is a virtuoso workout for a text-reciting percussionist playing an extended drum set and doing some wonderful interlocking motival-rhythmic figures on the tom-toms especially. It is rare to have such a well developed sense of abstract melody present for a drummer and Stuart Gerber rises to the occasion with a very nice performance. It remains after repeated hearings one of the best such works I know. Solo classical guitar gets a nice turn in a well-constructed work, "Needlepoint." It has that contemporary classical guitar-meets avant jazz melodic-harmonic sensibility going for it. What's especially nice with this piece, and indeed the music on the CD as a whole is that Ms. Hindman finds her own particular way of capturing "what's in the air" right now. And she has found her own voice to express it. The final work "Magic City" brings her inventiveness to bear on the full symphony orchestra. Hindman's rhythmically alive music and her motif developing prowess gets a full large-scale realization in this very captivating ten-minute work. It has a lyric sensitivity and a nice use of instrument section interplay that make me wish I could hear more of her orchestral work. For now it is certainly very good listening. So there we have it. Dorothy Hindman is a voice, an original voice that comes through consistently on this program of her works. She has allowed us to hear six very idiomatic and inventive pieces and I certainly look forward to more! In the meantime I do recommend you give this one a hearing, especially if you like your modernity with an avant jazz inflection, but over and above that it will bring lots of rewards to anyone interested in contemporary music. The world of contemporary composition is, as much as ever before, a multi-stranded stylistic affair. Side-by-side these days there are the high-modernist post-serial composers of various stripes, then there is post-romanticism, minimalism, new avant tonality, pan-harmonic, pomo collage, neo-classic, and any number of other possibilities, all as we have seen in these pages, coming to bear on what for more than 100 years we have considered a part of our age. Composer Jan Van Der Roost has another take on all of this, well-represented on his CD Sirius and Other Works for Orchestra (Navona 5919). There are three works presented for our consideration: "Sirius," a "Sinfonia for Orchestra," and "Manhattan Pictures." It's music of a dramatic cast, very dynamic and descriptive, tonal with some more expansiveness than one might find in a "typical" neo-romantic, music with much in the way of kinetic energy and a somewhat mysterious cast. The mystery is more to the forefront on "Sirius" and the Sinfonia; the kinetic energy is there to greater or lesser degrees in all the works but especially "Manhattan Pictures." These are works that undoubtedly take a good bit of rehearsal to resound with the multilayered, orchestrally diverse sound-color palette and rhythmically-dynamically expressive tempestuousness that the composer often favors. The St. Petersburg State Symphony Orchestra under Vladimir Lande takes on the first two works; Fernand Terby conducts the Philharmonic Orchestra of the Belgian Radio for the third work. I'll admit there seem to be moments here and there where they could have benefitted from a tad more rehearsal time, but the spirit of the composer comes through strongly in any event and these stand up as quite worthy first recordings. 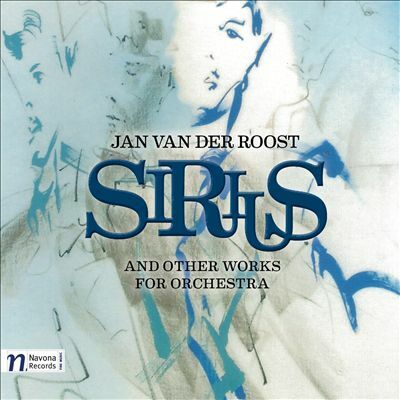 One exits the CD with a very clear feeling for Van Der Roost and his orchestral style. There is sometimes a feeling that we are listening to the music that follows in the heritage of "The Rites of Spring" but in such a furtherance that the offspring has established an identity fully personal. Moreover it is music that in a way synthesizes and re-presents the heritage of orchestral developments we have seen over the past 100 years. That is the case. The music fascinates. It will give your ears and your aural imagination a real workout--not to mention your music system! What is it about the music of Claudio Monteverdi (1567-1643) that stays with you long after the music is gone? The text answer is that he was one of the very most important composers of the early baroque. But his vocal music sounds like no other, so it is not just a matter of paving the way, he is his own way. There is an expressivity unparalleled in his era. He has a sweetness in his music that is almost a romanticism, like Rameau after him. There is counterpoint but a throughness that parcels out into musical prose in different ways ways than a Bach or a Handel. 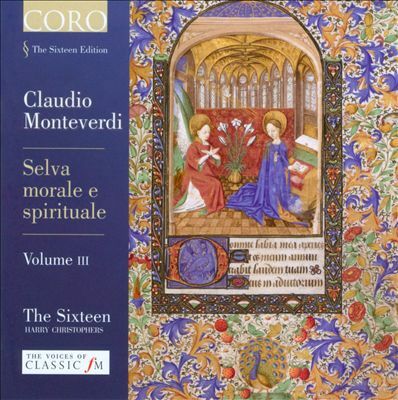 You can hear Monteverdi at his best in the Selva morale e spirituale, Volume III (Coro 16109) which The Sixteen, a wonderful choral group, has put out of late. It is music for soloists, choral group and often a small chamber orchestra of ten players. The Selva were published towards the end of Monteverdi's lifetime and remain some of his very best sacred music. The aggregate, amassed singers and instrumentalists that make up the Sixteen for this project sound wonderful, perfect. Director Harry Christophers gets a judicious balance between expression and form, between intimacy and impact. I have not heard the first two volumes as yet, but if they flow with the impressive directionality of Volume III, they are seminal, indeed. Recommended for anyone who loves Monteverdi or those who do not know his music, and anywhere in between. In any event this is top-notch and very satisfying. A really good percussion group must have dedication, a pliable sense of precision-in-artistry, a fully developed sense of the musicality of the proceedings and perhaps above-all flexibility. The sheer number of pitched and unpitched instruments one may be called upon to master in a composition can be virtually endless, as is the need to switch from one to another when called upon, sometimes in rapid succession. 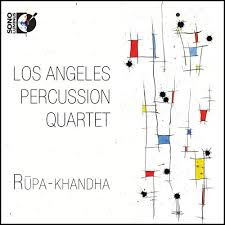 The Los Angeles Percussion Quartet shows all these qualities in abundance on their CD Rupa-khandha (Sono Luminus 92150). These are world premiere recordings of what the back cover describes as "the newest music for percussion ensemble, in the tradition of the great West Coast mavericks," and that rings true. The intro to the liner notes, if we have any doubts, spells-out who those composers would be: John Cage, Lou Harrison, Henry Cowell, Harry Partch, Terry Riley, James Tenney, Frank Zappa, William Kraft, Emil Richards and Steven Schick. A formidable list of pioneers, not all of whose careers of course were entirely synonymous with that region, but all of whom had important West Coast presences for at least part of the time. One could sum up a commonality by saying all had a fascination with aggregates which at least included percussion instruments, some unconventional, some invented, and pioneered the rule-breaking, all-the-world influenced music approaches we have come to embrace today. And you get that influence evolved and continued further in the four pieces on the program--"Ritual Dances" by Eric Guinivan, "Rupa-khandha" by Sean Heim, Joseph Pereira's "Repousse," and Jeffrey Holmes' "Occasus." I will not go into a blow-by-blow description of each work recorded here, partly because they flow together in such a way that they tend to work together for one very lasting impression, and secondly, it is music that is better served by hearing it. The composers may be new names to you (as many were to me) but they each have a mastery over the percussion arsenal and write music that fits a West Coast ethos. As many Sono Luminus releases, this one comes with a conventional two-channel CD and a multiple-option, surround sound 24-bit Blue Ray disk. I was unable to hear the multi channel version alas because I do not have Blue Ray capability, so I cannot comment on those mixes. It's the sort of multi-timbred music that will stand out in such a playback environment. The CD itself has excellent sound. The Los Angeles Percussion Quartet has the concentrated dedication, skill, and beyond-ness feel to pull this program off with flair. The composers have given them much to work with and they sound great! Recommended. 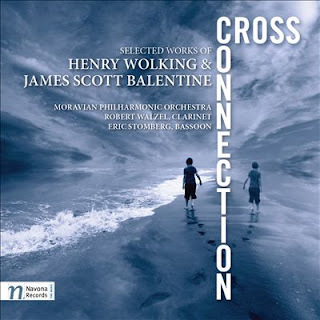 Some lesser-known names today in contemporary composerdom: Henry Wolking and James Scott Balentine. They share a friendship . They also share a similar musical outlook which can be heard in a program of original works that fit together nicely on Cross Connection (Navona 5903). Both American composers have an eclectic yet distinctively melodic flair to their music, and the three works have in common an expression of the relations between life, love and the musical arts. Henry Wolking comes to us with two works, James Scott Balentine one. Wolking's "Gone Playing" is about epitaphs and the life and death of those they are written for. It's a vibrant work that features clarinet (Robert Walzel) in a prominent role against an extroverted string orchestra backdrop (Moravian Philharmonic Strings under Per Vronsky). It has jazzy elements and a rather cheerful demeanor given the subject matter. And it pleases with some beautifully lyrical, melodically articulate passages. Wolking's four movement string quartet "The Old Gypsy" reflects Hungarian-based themes intertwined in a densely expressive modern yet tonal sophistication. It is well played by four members from the Moravian Philharmonic. The symphonic work by Balentine that concludes the CD, "Dun Eideann Blogh" brings Walzel back on clarinet along with bassoonist Eric Stomberg for a very pleasingly lyrical work that represents a recollection of times spent in the company of family and friends. The Moravian Philharmonic are put to excellent use (again under Vronsky) in a modern, excellently orchestrated score that has playfulness and some compelling modern counterpoint-interplay that keep one's interest. It sounds better to me each time I hear it. All-in-all this is quite rewarding music. I was especially impressed with the two orchestral works, but the string quartet has a refreshing quality when heard between the orchestral poems-essays. Nice music! Both Arnold Schoenberg and Anton Webern did recomposing and re-orchestrations of baroque compositions. Both created fascinating music that allowed you to see for a moment the composer's mind at work. 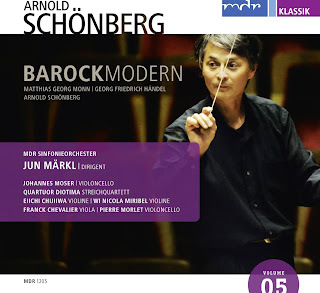 Volume Five of the Barock Modern series (MDR Klassik 1205) gives us three such works by Schoenberg: Matthias Georg Monn's "Concerto for Harpsichord and Orchestra," adapted and recomposed as a cello concerto by Schoenberg in 1932; Handel's "Concerto Grosso, op 6, no 7" freely interpreted by Schoenberg as a "Concerto for String Quartet and Orchestra" from 1933; and the "Theme and Variations op. 43B" composed by Schoenberg in 1943. The latter is not a baroque-based adaptation as much as it is a wholly original work, but it nonetheless fits the program well as music steeped in tradition, a most creative use of hindsite to the Schoenbergian ethos. This recording is realized with care and sympathy via the sensitive conducting of Jun Markl. The MDR Sinfonie Orchester with soloists Johannes Moser, cello, and the Quatuor Diotima String Quartet do an admirable job with the scores. There are fairly large orchestral forces in play throughout. The orchestrations are both more late romantic (almost Mahleresque) than not at times and also have spots of brilliant color as you might expect from the composer of "Pierrot Lunaire." The melodic motives often remain contrapuntal but there are shifting groupings of instruments and cell-like motif re-divisions more typically Schoenbergian than baroque. Of course this is as we would wish. The point is not to remain authentic to the period as it is to transform while retaining baroque essences in various ways. After hearing the two transformed works, the "Theme and Variations" takes on a different light. We hear in the variations the same brilliant handing off and cellular restructurings of the original theme. In the end this a vibrant Schoenberg, tonal, accessible, yet fully modern. It's probably a great volume to start with if you are slightly modern-shy and wish to experience Schoenberg in stages, as it were. But the music stands on its own as something listeners on any or every level can appreciate. The performances are quite good and one goes away from the program with the urge to hear it again, and perhaps again. Very much recommended. 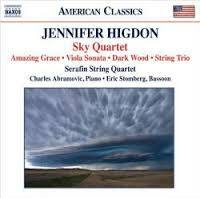 These days composer Jennifer Higdon gets lots of attention. Her works are frequently performed. Of course like anybody there was a time when that was not so. She started out with the first works, a very promising student of the music, and worked her way into an individual style and widespread recognition bit by bit. The Serafin String Quartet along with Charles Abramovic at the piano and Eric Stomberg on bassoon bring us an interesting selection of early to relatively early chamber works on the new release Sky Quartet (Naxos 8.559752). In it we hear Ms. Higdon immersed in poly-stylistic expression with surprising maturity and budding mastery. Her lovely quartet arrangement of "Amazing Grace" (1998/2003) sets a tender initial mood that contrasts dramatically with the four movement "Sky Quartet" (1997/2000) that has both lyric archaicist neo-romantic lilt and dynamic modernism at its core, alternatingly. It depicts the panoramic sky of the Western US in its ever-changing moods with vivid, singular tone painting. The 1990 "Sonata for Viola and Piano" brings a late-romantic expressiveness to bear in the slow movement; more animated and playful in the "Declamatory" finale. Here is a Higdon perhaps more influenced than influence, but inventive and captivating nonetheless. "Dark Wood" (2001) is a quartet for bassoon, violin, cello and piano. It has great rhythmic verve, a mellow bittersweet rhapsodism and a dark, woody earnestness that brings us a solid look at the fully realized Higdon at her best. The earliest piece of the batch, her "String Trio" of 1988, shows a modern, widely harmonic palette and an inventive imagination already then at work. The performances match the scores for dedicated singleness of purpose. Ultimately a picture emerges of a bright young musical personality with an idiomatic feel for chamber music and string writing, a smart and warm musical demeanor and a stylistic expansiveness that signal and prefigure the ever-more satisfying works to come. There is no feeling of the sophomoric in these pieces. And they have great charm and lyric power. As one continues to listen to music throughout life, there are moments of surprise, usually pleasant, that can occur from time to time. 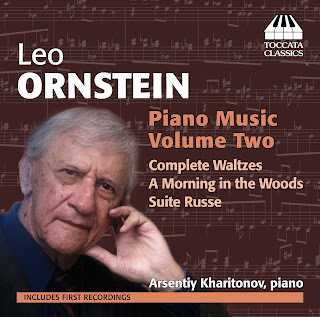 One such came about when I listened to and reviewed Leo Ornstein's Piano Music Volume One (see post, October 22, 2012). Ornstein came to a certain amount of notoriety as an early modernist in the US in the second and third decades of the 20th century. The LPs I had managed to find years ago focused on that period, with some intriguing music but nary a hint that there was anything else. It turns out that Ornstein led a long life (1894-2002) and continued to compose. There was much more to hear! That continues to be so with the release of Leo Ornstein's Piano Music Volume Two (Toccata Classics 0167), a revelation in its own right. Ornstein, both Jewish and Russian, spent his childhood in his native land, coming to New York in his early teens. He gathered attention as one of the proto-avant composers on the scene and then fell into obscurity. But as Volume Two makes even more clear, he kept going. Arsentiy Kharitonov brings passion and dash to the works represented here and they are sometimes fiendishly difficult. In their best moments they show a composer of extraordinary originality, combining Russian-Jewish roots with a touch of neo-impressionism, and a well-wrought modernism that sometimes startles with brash dissonance and kinetic fire. The centerpiece of the volume is a wondrous series of waltzes (s400-16), 17 in all, composed between 1958 and 1980 but somehow recalling an earlier world, both of the avant early years and the late romantic Euro-Russo ethos, as if seen and refracted through the prism of time. They are marvelous, as is Kharitonov's acutely multi-stylistically sensitive performances. They occupy more than an hour's time in the program and make for essential Ornstein, well worth experiencing! "Suite Russe" in seven parts takes us all the way back to 1914. It shows an Ornstein thoroughly steeped in impressionist-romantic ethno-melodic vibrancy, very beautiful and memorable. The last is a glimmering impressionist "A Morning in the Woods" from 1971, showing the sensibilities of someone as if emerging from a time-machine to bring us genuine expression from an era now long gone. This is a beautiful disk, revealing for us an Ornstein we have never fully appreciated, perhaps until now. A master. Thanks to Naxos' ongoing project of issuing and reissuing a comprehensive selection of the music of Peter Maxwell Davies, I am coming to appreciate the impressive breadth and quality of his work. I've covered a few of his later symphonies on these pages (type his name in the index search above for the postings). 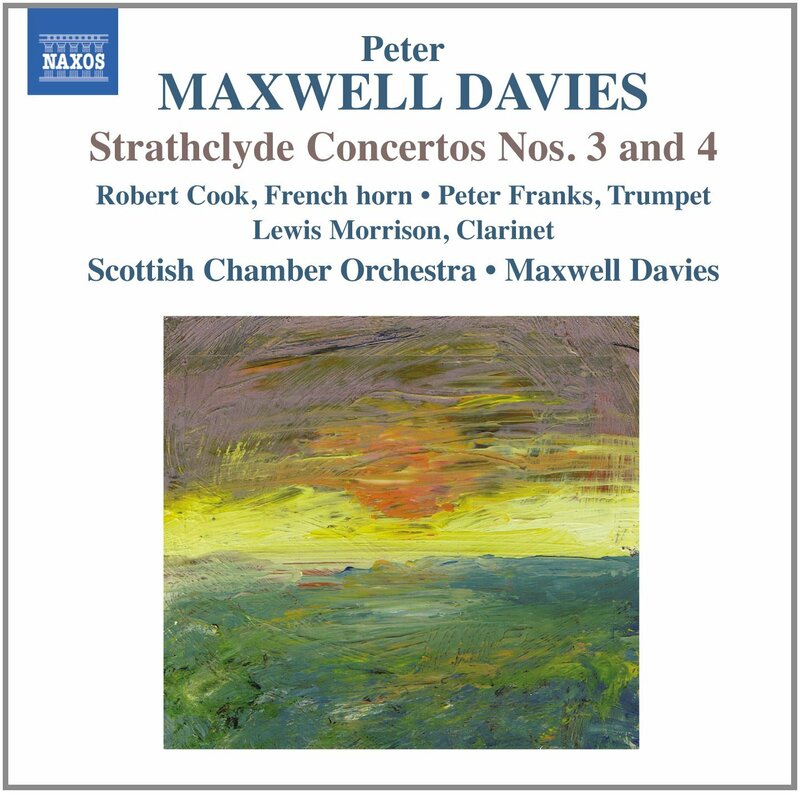 Today it's a re-release of the first recordings of his Strathclyde Concertos Nos. 3 and 4 (Naxos 8.572353), previously issued on Collins Classics sometime in the '90s. These are impressive works, impressively performed by soloists and the Scottish Chamber Orchestra under the composer. The Strathclyde Concertos were commissioned and premiered by the orchestra. The performances are authoritative. Concerto No. 3 features Robert Cook on French horn and Peter Franks, trumpet. It is the extroverted virtuosity of the horn/trumpet parts that carries the day, with modern, angular, acrobatic dynamics and a beautifully conceived orchestral melange. Concerto No. 4 is no less vibrant, with clarinetist Lewis Morrison taking the central role with a puckish demeanor and the orchestra unfolding a cornucopia of colors and tonal blends. 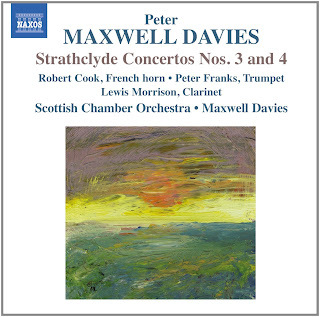 Both works are singularly sublime in their own way, proceeding from the classical form of concerto give-and-take and making of it both something thoroughly of our time and distinctively Maxwell Davies in its overall thrust--in other words not neo-classical, but neo-Maxwell Davies. Whereas the later symphonies often have a kind of soft focus to them, these concertos have a hard-edge in their melodic-harmonic outlining. This is music of boldness and robustness, virtuosity and a striving outward. It is hard to imagine better performances and the works fully satisfy while bringing to our ears a most engaging side of the composer in a serious yet at times playful frame of mind. A major addition to the Maxwell Davies oeuvre! The Middle Ages was a psychic maelstrom. Yes, it was an age of faith. In Europe Christianity was central to most people's way of life. There was also a revival of learning, of course. But to anyone who has experienced Bosch, the Bruegels and some of the imagery contained in Illuminated Manuscripts, you know it was an age of dark thoughts. Hell and the Last Days seemed close, much closer than it does to us in our secular age. Both the Old and New Testaments have some very dark passages, and it seems the Middle Ages knew them much more intimately, much more literally than we do today. In everyday life there was widespread, endemic everyday violence. The persecution and torture of those outside the orthodox political and religious mainstream was all-too-common. The darkness of the Middle-Ages soul comes through hauntingly, domestically, in George Benjamin's singularly strange and dramatic opera Written on Skin (Nimbus 5885-6 2-CDs). This is the recording of the first performance, at Festival d'Aix-en-Provence, July 2012. 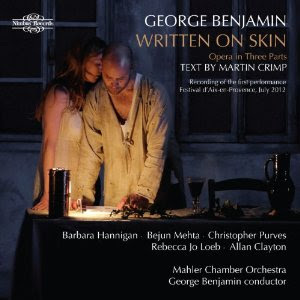 The cast of singers, Barbara Hannigan, Bejun Mehta, Christopher Purves, Rebecca Jo Loeb and Allan Clayton is quite excellent, as is the Mahler Chamber Orchestra conducted by the composer. The text/libretto is central to the singularity of this opera. It was written with a poetic bareness and vivid matter-of-factness by Martin Crimp. I would first off venture to say that I have not experienced such a moving combination of libretto-story and musical expression since Wozzeck and The Devils of Loudun. A central protagonist is the figure of the "Protector" who rules over his wife Agnes and apparently his feudal subjects with tyranny, yet he professes also a religious purity. The story begins when he commissions a "Boy" artist to create an illuminated manuscript, literally "Written on Skin." In the course of its creation the inner torments and unbalanced excesses of the Protector and the pointed revenge Agnes takes upon her Protector/Tormentor through the Boy involve a bringing of inner thoughts, dark visions to the outside, a making visible of an infernal series of visions if you will. The skin in the end is much more than the manuscript; the horrible world created in the process is brought to the outside, to the "skin" of the protagonists as well. The story has the hallucinatory darkness of a Medieval vision of hell on earth. Text and music conspire together to create an unforgettably vivid drama. I'd venture to say it is along with the previously reviewed new opera Architect (see July 24, 2013 posting) a landmark work of our current era. As a bonus the 15-minute Benjamin work for piano and orchestra, "Duet," rounds out the second disk in fine fashion. Written on Skin illuminates a world paradoxically without much in the way of light. In the end no-one wins, yet in the process a brilliant work of art is created. It is a story of contrast, of despair, yet of singular beauty. Do NOT miss it if you are in the modern camp and/or wish to experience contemporary musical drama at its very best!